Beware of Fake Emails asking for password & Critical information - Its a trap ! Some days back one of our readers forwarded an email to me, which he got in the name of SBI Bank and it was about some new scheme or feature launched. All he had to do was login to his account by clicking on the LINK given inside the email. He asked me over the email if this mail was genuine or fake ? You can see the snapshot of the email below. I looked at the email and instantly sensed that this was some kind of fraud email, just to get hold of the login details of the mail receiver. In this article I want to cover few points which will teach you more about these kind of fake emails and some important points, so that you are not duped in future and are alert. There are few common traits of most of the fake fruad emails you will recieve, you should notive these 3 points in those emails. One of the most common trick used in fake emails, is that the email id used by them looks very authentic, but if you enquire a bit about it, you will find out that they are fake and just gives an impression of being authentic. For example , if you get an email from SBI Bank and the email id is “alert@sbi-bank.com”, at first you might get fooled that the email is really form SBI bank, but if you go to google and and search for SBI Bank website, you will come to know that its sbi.co.in or onlinesbi.com, but the email has come from a different place. 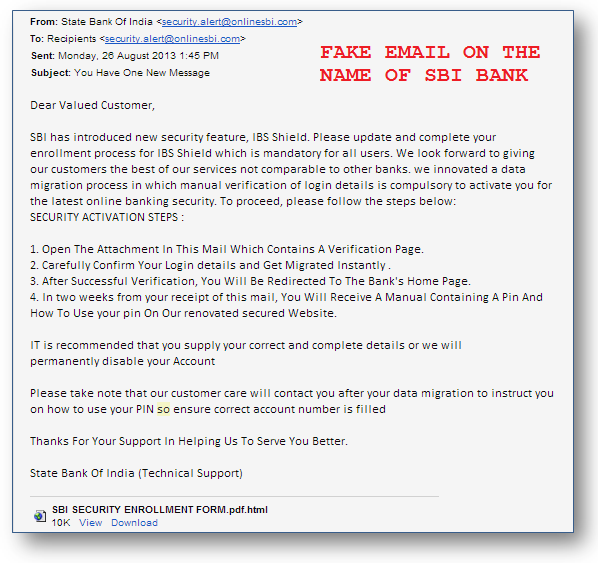 You should check the website of the fake email id (in this case – sbi-bank.com) and you will come to know that either it does not exist or looking at the website, you will figure out that its Fake. I can share a real life example of this. My brother faced this fake email some months back. He was searching for a job and he got an email from Larson & Toubro company, that his resume was shortlisted and he has to attend an interview, but he had to give a security deposit of some amount (around Rs 8,000) which he will be refunded back after the interview. The moment I heard this, I knew this is some fake email, because no company asks anything like that. I asked him to search for larson & toubro website and it we landed on www.larsentoubro.com/ ‎ . 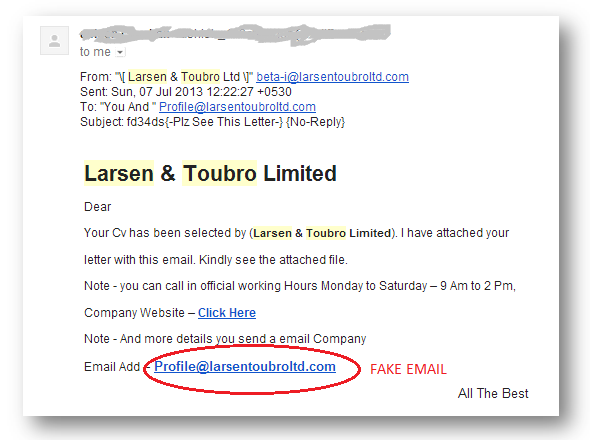 However the email came from profile@larsentoubroltd.com/ ‎ (extra ltd word in email), when we went to that website (the fake one) it did’nt exist. When we searched on internet about it, we got so many threads about about it and how they lost money. Given our country has so much of unemployment, and so many people are looking for jobs, its easy to dupe them and run this kind of rackets. Infact people make millions through these kind of fake emails. Below is the email which my brother got for interview, you can notice how unprofessional the email sounds. Note – Many times, you will also receive emails coming from the original sites and web-address, but even there is a trick for that, if you use 3rd party email sending software’s, you can fake your email id. You will notive in your email that the mail came “via” another server. A lot of times, inside the fake email you have a link to click, it takes you to some target website and you have to fill some personal details. In reality, the website is a fake one, which looks real visually, but on the backend its a fake one. This is called as PHISHING Trick, which steals your important login details and misuse later. So always make sure that you have all the important links written down or saved as bookmarks in your browsers. If you see all the fake emails, one common thing you will notice is that these emails scare on some point and create some kind of emergency. It can be regarding some new change, new scheme, last date for something, It might say that the server was compromised and they are just asking for proof and things like those. Always remember that banks or institutions do not ask for these kind of things over email. Passwords are never asked by anyone over email for sure. At times fake emails use name of RBI and Income Tax department so that people take it seriously because there is some kind of fear attached with it (ohh …. its email from Tax department, better I take it seriously). Checkout the Video below which explains about the RBI Email Scam ! If you look at the fake emails and their websites (the link inside the email). You will notice that they have very bad grammar, no professional look and they ask for some stupid thing to be done which does not look natural. Like some of your friend in Hawaii, who is robbed and now needs $400 to come back to India and will give back your money later, such kind of emails come from hacked emails of some of your friends. When do Fake Emails Arrive ? These fake emails can come anytime to you, but note that the frequency of mails increases, when some important event is nearby like income tax season, or income tax filing season or when some major law has changed, so that people can relate to fake emails. What’s your thought on this matter and have you ever got an email asking you to click on a link and provide some critical information? And what did you do in that case ? Can you share ? Thanks for sharing your case Satish ! On a different note a lot of people do not take precautions to provide their correct details to banks or utility companies or even financial organizations. I have had multiple instances of receiving bank statements, loan statements and even telephone bills and orders from online shopping sites addressed to the wrong person. I still take the pain to inform the banks although it is a pain to find the correct email id to address the concern. It is important to provide correct details or an identity theft is just a click away. Thanks for sharing your views on this and highlight ! sbi is sending instant password to mobile during every fund transfer. All the other banks should do it. It is almost safe i think. Canara bank also sends OTP for every bank transfer. This seems safer approach. There can be additional checks added if the amount transferred is huge to avoid relatives/friends also doing mischief if anyone has given them the access to do so willingly also. Thanks for sharing that Sunil ! 1. Check weather the http is changing to https when you login into the banking website. It’s secured access. 2. Don’t google search the bank website name & open the site, directly type the official banking official site when accessing the internet banking account. 3. Don’t keep a file with file-names passwords.txt or similar in your computer. It’s hard to memorize so many passwords, hence try to remember the passwords most of them, or else use a pendrive kept safely in wardrobe with such sensitive info. 4. Never access your account from net centers etc. 5. Keep card lost reporting banking numbers in your mobile so that you can block the same instantly when needed. 6. Do have a good antivirus in PC & smart phones. Though these may appear simple, we tend to ignore them sometimes. The first screenshot you have shown in this post as a fraud email has a genuine domain name in its “FROM” email address. Your first screenshot showing email address ****@onlinesbi.com and when I check onlinesbi(dot)com it is official SSL protected SBI website. Just want to ask if there is any typo mistake or confusion? I was also meaning to ask the same ? Great observation. Mandar – Glad that you brought up the point here. There are programs (very simple to write if anyone knows Java / .NET) that can send emails with a different id. Remember that if an email asks about your PIN or password or asks you to download a file and enter your User name and password then there is something fishy about it. Thanks for educating us time and again. Your valuable information protects not only investors but also all online users in a way or other. Great job! Keep Going! Such emails are being received regularly. The main thing is where to lodge complaints to this or if there is any email id to forward such emails. I normally check the bank websites and if they have a link to fwd, I fwd them, but only sometimes. Can you please do a post on what actions to take once we get such emails. I think that will be a good deterrence ? Thanks Manish for the valuable information. I also got similar message through SMS informing about winning of lottery and contacting at a given number and sending SMS. By the way, can we proceed legally against such unscrupulous persons after getting their IP address traced and filing complaint with the competent legal authority. It would be nice in the interest of all of us to have recourse to such type of fraudulent activities. Yes, you can complain to Police on this , They will transfer the case of Cyber Cell of their office mostly ! Thanks Manish for the nice information, apart from such mails & sms, I faced a situation where in I was told by some lady from Delhi information office something that I need to call a lawyer as a case has been registered in court with some money transaction matter someone, So she requested me to note down the mobile number of advocate who will tell me details & guide me through. Now I knew that this was totally fake, so told to send legal notice to my address first. Got a call couple of more times before this nonsense had to stop. Please do let us know where to complaint for such things. Useful article. Can you please help us by knowing where to file complaint of these fake emails or calls?? Manish, this are quite common this days. Apart from email they have started it on SMS also. My name is Mrs. Melissa & I have 8.5 milllion dollars to transfer to you in charity name to help poor ones in your place india. contact me mrs_melissa01@hotmail.com. And this is from a mobile no. We need to be really aware – I receive emails from Raghuram Rajan (RBI governor) for so many million dollars I have recived as coca cola gift. Yours faithfully, Dr Raghuram Rajan. I once recieved the similar mail from Indusind Bank and immediately i found some foul play becuase i was not having any account in Indusind Bank. Next Day Same E mail i got from PNB and next day again from ICICI.